Simon & Schuster, 9780671888022, 352pp. Storyteller, rebel, medicine man, Lame Deer was born almost a century ago on the Rosebud Reservation in South Dakota. A full-blooded Sioux, he was many things in the white man’s world—rodeo clown, painter, prisoner. But, above all, he was a holy man. 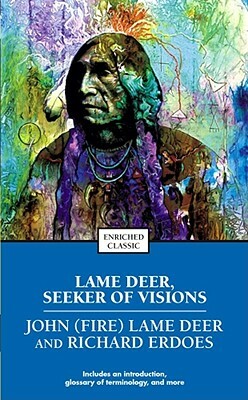 Lame Deer’s story is one of a harsh youth and reckless manhood, a shotgun marriage and divorce, a history and folklore as rich today as when first published—and of his fierce struggle to keep his pride intact, living as a stranger in his own ancestral land. Richard Erdoes is the author of more than 21 books, including Lame Deer: Seeker of Visions, and American Indian Myths and Legends. An Austrian-born historian, ethnographer, and artist, he has contributed to many publications, including the New York Times, Time, Life, Fortune, Smithsonian, and the Saturday Evening Post. He lives in New Mexico. Alvin M. Josephy, Jr., author of Indian Heritage of America A wonderful book...destined to become a classic. Alvin M. Josephy, Jr., author of Indian Heritage of America Lame Deer is a magnificent American....He has demolished so much misinformation and so many stereotypes about Indians and their values and ways of life that we should be ashamed of how little we have actually known of all that he has to tell us. As an individual and as a representative of his people, he is someone whom all readers should get to know -- not just those who are interested in Indians, but every American. The book is destined to become a classic. It will be read, and reread, and quoted from through the years. Personally, I am enormously enriched by it.